Martin Varga is a 35-year-old man with a plan. Originally hailing from Germany, Martin wants to breathe life into a disused fish factory near Husavík in North Iceland. He plans on turning it into a hotel and café bar in order to share his love of Iceland with visitors. It’s an ambitious project, and one for which Martin has turned to crowd-funding to assist with. My own crowd-funding experience was wonderful and overwhelming (for my book, Iceland, Defrosted), but Martin’s is on a different scale. To add to this, his work schedule is over a period of years not months. The work required is no small task. It’s huge. Martin is used to challenges; he has been a wildlife cameraman in the inhospitable Antarctic and Greenland, for example. I have a theory that anything is possible in Iceland. Icelanders have a knack for making things work, for turning the impossible into the possible. Lets hope that Iceland can do something for Martin. Intrigued by his plans, and maybe a little jealous, I spoke to Martin to find out a bit more. Tungulending is a small abandoned fish factory in the north of Iceland. 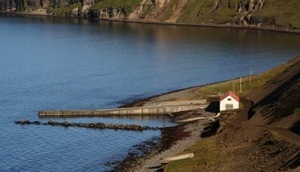 It is located in a wonderful bay below the steep cliffs of Tjörnes peninsula right next to the North Atlantic Ocean. Even though the factory building is at one of the most spectacular places and in a very special and beautiful surroundings, this spot has not been in use for the last 15 years. What did it used to be, and what happened? Tungulending was used to process salt fish, and later, lumpfish caviar. Fishermen from Tjörnes used the pier to land their catch and used the building to work and to store the fish products and their fishing nets. Tungulending was shut down about 13 years ago and since then the building has been waiting to get a new function. My plan is to get Tungulending alive again. I will open a guesthouse and café in Tungulending and will make this wonderful spot more attractive again for all visitors and locals. My vision is to offer the most beautiful view over Skjálfandi Bay and create a place for everyone to enjoy a pleasant time with nature and fresh food in a relaxed atmosphere, outdoor activities, cultures events and workshops. I want Tungulending to become a place to get inspired, work in a creative surrounding, or just somewhere to meet people from all over the world. The crowd-funding campaign ’Welcome to Tungulending’ is running to share this project and get support from everyone who likes the idea of Tungulending. It is an opportunity for everyone to work together to help to get it started. What if you don’t meet your funding total? Is that it? If the ‘Welcome to Tungulending’ campaign does not reach the funding goal of USD 26,000, then me and the team around Tunguleding will have to work even harder to get the guesthouse aand café open in June 2015. There is no doubt that we will do this project, because it is a dream of ours. We have already found so many people who think the same as we do and fell in love with Tungulending. What are your links to Iceland? And how did you get involved in Tungulening? I have been living and working in Iceland since 2006. First it was only a visit, but I realized immediately that Iceland has so many great opportunities to offer. The nature is beautiful and Icelandic people became friends of mine from day number one. I became involved in film productions about nature, wildlife, science and outdoor adventures and also I could get a lot of experience while working with visitors from all over the world. Since 2009 it has been my dream to have a beautiful house to live in and to open my own guesthouse and café. Tungulending is the perfect location and building to make this dream become true. Iceland is special and I want everyone to discover why it is so special. What is your experience with crowd-funding so far? I think this alternative way of financing a project is great. It is amazing to know how many people like the idea of Tungulending and support this project as much as they can. I am in contact with all the contributors and I am sure to meet a lot of these open and motivated people again in Tungulending as soon as we open. Everyone can help with a donation. Every single dollar is important and very much appreciated, but it is also helpful to spread the word and make sure that Tungulending gets a lot of attention. Please tell your friends about the crowd-funding campaign and invite everyone to join and get involved in the project. You can find out more, and track progress at www.tungulending.is. I wish Martin all the best. I have no doubt that he will achieve his goal and revive Tungulending into a special place once again. He has a sheer determination and drive that will see him through. If that fails, Iceland has a way of making everything turn out just fine. This entry was tagged cafe, Crowdfunding, hotel, huasvik, Iceland, north Iceland. Bookmark the permalink. « Send me your Iceland, Defrosted snaps!